Cameron Highlands was named after William Cameron, a British Government surveyor who discovered it in 1885 on a mapping expedition but failed to mark his discovery. It was not until 1925 that Sir George Maxwell recorded Cameron's discovery and developed it as a hill station attracting British colonials and expatriates, including British planters who realised the potential of its fertile mountain slopes for growing tea. Set 1,500 metres above sea level in a forested mountainscape, Cameron Highlands Resort is built as a long extension from an existing 1930s cottage with architecture dating from the 1070s. 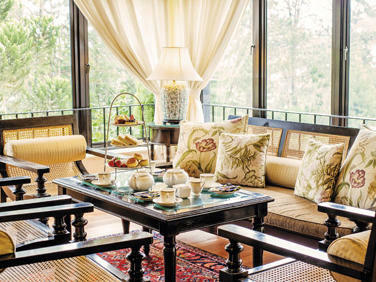 Promising splendour, romance and nostalgia, the interiors hark back to its grand colonial heritage with tall French doors, timber-beamed ceilings and plantation shutters combined with the colours and textures of Jim Thompson’s famed Asian silks. This is mirrored in the friendly service, where traditional English charm merges seamlessly with discreet Asian hospitality. Endearingly known as the 'little piece of England in Asia', the cool climate on the picturesque plateau and its hilly greenery are tailor-made for rounds of golf, pink-cheeked rambles along jungle trails, tea plantations, farms or gardens, afternoon tea with scones and spa treatments that celebrate the restorative powers of tea. Elegant interiors, lush surroundings and five-star care set the tone for the perfect highland getaway filled with trails, tales and traditions. The accommodation at Cameron Highlands Resort captures the nostalgic elegance of an age where quality and care were a way of life. Bespoke furniture merges with the beauty of Jim Thompson's finest quality fabrics – teak and silk combine to create an environment that is both beautiful and comfortable. Sleep in the comfort of large four-poster beds surrounded by a mass of soft cushions, or curl up on the day-bed and read a book, whilst nibbling on fresh strawberries and sipping a cup of locally grown tea. 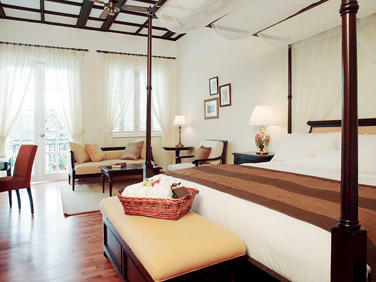 Each room features an elegant colonial design that is spacious and comfortable. There are 56 well-appointed rooms and spacious suites. All rooms and suites enjoy a beautiful view of the golf course against a backdrop of rolling hills and lush green forest. Dining at Cameron Highlands Resort sees traditional English cuisine meeting the many tastes of Asia in a mouth-watering symphony of flavours and experiences. Enjoy meals in elegant surroundings be it at the main dining room or the resplendent tearoom, with vistas overlooking the golf course, or in an open dining concept restaurant that merges seamlessly into the lush jungle around. Guests can also select to dine on the terrace under a starlit sky, at a candlelit private gazebo, by the crackling fireplace or indulge in a signature picnic at the tea gardens for a truly memorable dining experience. Spa Village Cameron Highlands is a unique haven for relaxation and rejuvenation where tea is the foundation for the experience. The award-winning wellness centre features healing therapies based on produce from the surrounding jungles and ancient tea rituals combined with knowledge drawn from the Orang Asli or 'original people' who have a deep understanding of plants, herbs and flowers that have the power to heal. 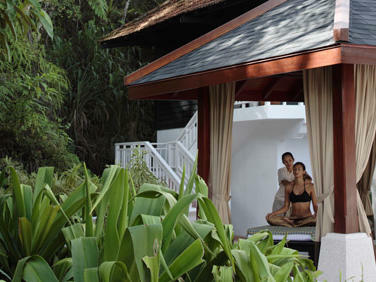 The tranquil emerald landscape of the highlands provides the perfect ambience for relaxation and rejuvenation.